When is it too hot? Where we train: Fortunately, unlike this section, the B&A Trail offers more shade than sun. The Saturday morning marathon training group's coaches and runners face a question for this weekend's training run: What to do about the heat? Facebook posts have already been issued giving advice for running outdoors in very hot and humid weather: Slow it down, run very early, hydrate, take salt. All great advice. But when should you NOT run in the heat? The physiology of heat is that when it gets hotter, your body diverts more blood to the capillaries of the skin in an effort to cool you down. The result? The muscles you use for running have less blood and thus function less efficiently. Running gets harder. And then there is the double whammy of high humidity and higher temperature. The same blog post cites research that shows "exercise capacity at a moderate intensity in a warm environment is progressively impaired as the relative humidity increases." Body temperature further increases because higher humidity keeps sweat from evaporating as quickly. Yet over-hydration can also lead to performance problems and equally disturbing results. I explored the dangers of hyponatremia - water intoxication - in a blog post on how much to drink. Researchers concluded that many runners were drinking too much fluid in longer races and training runs. With hyponatremia, you drink more than you sweat and urinate and dilute your blood’s sodium levels. The sodium imbalance can cause cells to swell, especially brain cells. In extreme cases, competitors died after drinking too much liquid during a race. The most current guidance on hydration is to drink when thirsty, not excessively ahead of racing or training to "bank fluid" or to excess during the workout or race. Replenishing electrolytes during exercise helps maintain plasma volume, which is depleted when you sweat. Hydration drinks with electrolytes help maintain plasma volume over time better than water alone (Anastasiou, 2009). Maintaining plasma volume will prevent decreases in performance associated with dehydration. Replacing electrolytes during exercise helps prevents hyponatremia from over-ingestion of fluids during exercise (Anastasiou, 2009, Twerenbold, 2003). Consuming electrolytes in a concentrated form such as in an energy gel will be most effective at combating hyponatremia. This is because intake of sports drinks alone can lead to hyponatremia since salt concentrations are more diluted than the blood. Consuming electrolytes may help prevent cramping during exercise. Some research (Seltzer, 2005) has shown that individuals who are prone to cramping tend to lose more salt in their sweat compared to athletes who do not cramp (Stofan, 2005), and salt replacement interventions have been successful at preventing cramping in some athletes (Bergeron, 2003). Do you want capsules, tablets, powder, concentrated liquid or a pre-mixed drink? Are you mainly after the traditional sodium and potassium replacement, or a more complex blend of ingredients? And how much sodium (salt) should be in the mix? It's up for debate - with Hammer Nutrition (Endurolytes) being a leading advocate for not viewing lots of sodium as the answer. A related point: Is it true that calcium helps you avoid cramping? Will you get your carbohydrates (and perhaps protein) separately or do you want an all-in-one solution? "For me right now, I am very comfortable with Endurolytes and Gatorade (with GU for added energy) - but if I were doing Ironman training and racing now I think I would want more sodium in the mix, given a high sweat rate over many hours, and I would be more interested in a one-product solution. "While I can cope with using Endurolytes, Gatorade, Gu and water while marathoning (with me carrying the Endurolytes and Gu and the race or the training program typically putting out the Gatorade and water), again, if I were in Ironman mode I might look at Infiniti:GO FAR, maybe even a customized formula, or at another nutrition option with appropriate electrolytes included." First, your size will make a difference in how you are affected by hot and humid conditions. Runner's World cites a study by renown running physiologist Timothy Noakes showing that the larger you are, the more strongly you will be affected by heat—so adjust your pace appropriately. In Noakes' study, he tested lighter runners (110 lbs. or less) and slightly heavier runners (averaging 130 lbs.) who in cool conditions had identical 8K times. When the temperature was increased to 95 degrees, the larger runners were 45 seconds per mile slower. Second, your level of acclimatization to hot and humid conditions can make a big difference. 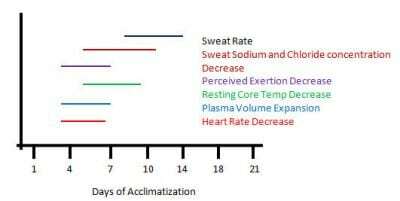 Physician/runner Bill Henderson in his IRUNFAR blog offers this chart showing how long it takes for our various physiological systems to adapt to on-going heat and humidity - to the extent that they can adapt, of course. Henderson writes, "The most significant change that occurs is an increase in plasma volume. Other things occur as well (such as changes in sweat sodium concentration, resting core temperature and heart rate), but plasma volume expansion is the key. After extensive acclimatization, plasma volume can have expanded by as much as 2 liters!" You will acclimate naturally to higher temperatures over the course of a season, but laboratory heat acclimation protocols put athletes in a heat chamber for about 1 hour a day for 7-10 days. Acclimatization is vastly greater (and more rapid) if you exercise in the heat. Generally it takes about two weeks of continual training in the heat to acclimatize. Unfortunately, if you stop heat training you will begin to de-acclimatize and can lose what you have gained within a couple of weeks. When and where you run in hot, humid weather can make a difference. Run very early in the morning or late at night, when it is cooler and, hopefully, a little less humid. Run in the trees and in shade rather than in the sun. Run on grass or another cooler surface than sun-blasted asphalt or concrete, in the shade if possible. If your normal course takes you from a shady trail to an exposed highway out-and-back, as mine will this weekend, change the route to avoid the hotter, exposed portion of the course. So back to the question: Is this a time when we should NOT run in the heat? While I am helping out our marathon training coaches this season, it's not my call on whether the group runs on Saturday morning, and if it does, what time the run starts and how the course might be modified, if at all. What my homework on running in heat and humidity says to me is that all who run in hot and humid conditions should properly hydrate, use appropriate electrolytes and be happy with a slowed pace. They should monitor themselves and their running partners for the signs of heat illness. They should seek a shadier, cooler route and start as early in the day a feasible. Running buddy Henry and I have tentatively planned to start our 17 mile run with the sunrise at 5:30 am on Saturday. We will cut out the more exposed part of our trail course. We expect to be slow. And we'll be ready to shorten, abandon or not even start the run depending on the weather and our response to the conditions. I learned my lesson about not being acclimated and prepared for the heat when a planned 20 mile run became a very difficult 16 mile effort in unanticipated heat. I crashed bad with some heat exhaustion symptoms afterward. Here's the story if you want to learn what not to do! If you run in the heat, be wise about it. If you don't, likely that's the right decision for you! June 2018 update: Here's another run blogger's take on running in the heat and humidity, with useful information and some good product suggestions. My recommendation to you on the products, however, is to support your local running shop and buy them locally if possible. Why would you need a coach for running or triathlon? I can answer that question! I have been personally coached for 37 years, for a number of years even by multiple coaches. And, these days, I am a running and triathlon coach myself. But since many more runners and triathletes don't have a personal coach than do, it may be more helpful to answer the question, "When shouldn't I get a coach?" Don't want to pursue a periodized training program tailored for your fitness and goals. If you are happy with random workouts, or what you think might be right, or what your friends are doing, or what you get from the web or a book, that's great. Aren't interested in getting faster (at least relative to your age group). If you don't care about better results or think you are doing what you need to do to get faster, more power to you. Don't want to get more satisfaction out of training and racing. If you don't care about attaining the greater enjoyment that comes from following a personalized training plan and seeing better results, with knowledgeable oversight guiding you, that's your choice. Aren't looking to improve your form and mechanics. If you aren't interested in exploring how form improvements can lead to better training and race times, so be it. Don't care about achieving maximum results while reducing the chance of injury. If you know when not to go hard as well as when to push it, and how to balance your training in terms of frequency, volume, pace and change of pace, cadence, active and passive rest, and cross training for best results and in a way the reduces your chances of becoming injured, then maybe you should be a coach. Aren't interested in having a knowledgeable guide with great insight into you who can help you see what to expect and how to respond. If you are confident you know how to cope with more miles and more hours, understand how to adapt to the stresses of hard training and racing, understand how to peak and taper, know how to lay out and execute a race plan, and have insight into what might go wrong and how to respond, then, by all means, do it yourself. Don't need greater insight into what you can really achieve. If you have a keen understanding of your real limits as opposed to what are perceived and self-imposed, and don't see the benefit of getting guidance in setting challenging goals that with proper preparation are within your reach, then you don't need a coach to help you realize and attain what's really possible. Won't be accountable. If you aren't interested in harnessing the power of accountability to get the results you want, than a coach is not right for you. Can't commit. If you are not able to commit even to a flexible training program tailored for your life and other commitments, then don't hire a coach. Can't part with the money. If you have little funds to engage a coach, even with the understanding that many coaches will work with their athletes to make their services as affordable as possible, and that the cost of coaching can be less per month than a sports massage or a few exercise classes, then getting a coach is not the right thing for you to do. See the benefits that you may gain from getting a coach? If so, give me a shout so we can explore how a coach can help you improve your results, expand your limits and get greater satisfaction and enjoyment from training and racing. As a coach, long-time runner and running store "shoe fitter," I am often asked about "the right" running shoes. Here's my guidance, distilled, absent the benefit of information about a specific runner. Focus on running relaxed, with a forward lean. Bring your sternum forward until your weight is balanced over your hips and equally distributed between your forefoot and heel. Engage your core by running with a straight back and your shoulders over your hips, with your arms engaged to help drive your legs. Run with a more efficient style: Faster, lighter steps. Don't over stride; Instead, use your core to lift up your legs. Rather than reaching forward with your legs, focus on fully extending your hips: Drive your the legs back from the hip. Pay attention to your tracking: You want your feet to be parallel to the direction you are running. Try to point your feet straight ahead on landing and on the pull through, staying aligned with your hips. Running in the right shoe is wrong if it is worn out. A worn out shoe does not provide the cushion, support and protection it is designed to provide, and, depending on how and where it is worn out, can produce or contribute to running injuries. The first thing my coach Jim Spivey asks a runner who is showing symptoms of a running injury is, "What's the mileage on your shoes? How long have you been running in them?" If the mileage is approaching or over 400 miles or if the shoes are a year old or older, he tells the runner to replace the shoes, adding this wisdom: "New shoes are a lot cheaper than a ortho or podiatrist visit." A pair of cushioned shoes for longer distance training (10 to 20 mile runs) and racing (half marathon to marathon races). Two pairs of light-weight trainers for shorter distance training (6 to 10 mile runs) and racing (10K to 10 mile races). An even lighter pair of shoes for short training (track distances to 10K runs) and racing (mile to 10K races). Examples of shoes with which I have some familiarity that offer cushioning and varied levels of correction for over pronation: ASICS Kayano and GT 2000; Saucony Omni, Hurricane ISO and Guide; Brooks Beast and Adrenaline; HOKA One One Ahrahi; Mizuno Wave Inspire and Wave Paradox; Nike Structure; New Balance 870; Adidas Supernova Sequence Boost. Examples shoes with which I have some familiarity that are neutral and cushioned: ASICS Cumulus, Nimbus and Dynaflyte; Saucony Ride, Triumph ISO and Freedom ISO; Brooks Ghost and Glycerin; HOKA One One Bondi and Clifton; Mizuno Wave Rider and Wave Enigma; New Balance Fresh Foam Boracay; Nike Zoom Vomero, Adidas Supernova; Sketchers GOrun. If you can afford it, rotate two pairs of shoes. This recommended practice is backed up by a research study that showed that runners who rotated among multiple models during the 22-week study had a 39% lower risk of running injury than those who almost always ran in the same shoes. Note that the benefit came not from rotating two pairs of the same model of shoes but from rotating different models of shoes so that "running pattern" and "external and active forces on the lower legs" varied during running. You can get away with it on race day. You might have noticed from my list of shoes that what I wear for racing is lighter, less of a shoe, than I wear for training. In my experience, while I don't want to train in less substantial shoes and risk injury, I can race in them. For me the benefit is both physical - I am running with less weight and therefore am slightly faster - and psychological - I feel lighter and faster and am inspired to race harder. Correction first, lightness second. All things being equal (which they never are), the lighter shoe should be the faster shoe. But it's more complicated than that. Stiffness can make a difference, as can how the shoe helps you manage foot-strike tendencies. The right shoe can help the runner achieve mid-foot striking rather than heel striking. The right shoe can help correct for over pronation (rolling to the inside on foot strike) or supination (rolling to the outside on foot strike). Selecting a shoe for lightness should come after selection for correction. The benefits of running in zero drop, minimal shoes are in question. Over the past decade much was made of running more naturally, as though running without shoes. The idea was that running with a minimal zero-drop shoe, with a sole that had little or no height difference between heel and toe, would mimic barefoot running, how man originally learned to run. The claim was that this would be the better way to run from the standpoint of injury prevention and speed. However, both anecdotal and scientific research have generally concluded that the claimed benefits of running in minimalist shoes have not been supported by the evidence, and that for some runners, especially those who are heavier, running in minimal shoes heightens the chance of injury. Don't over-correct correction...unless your foot doc says to. Sometimes I see runners buying shoes that correct for over pronation and provide arch support put over-the-counter orthotics in their shoes. The orthotics, like their new shoes, are designed to correct for over pronation and provide arch support. The result can be over-correction that can raise the likelihood of injury (and, at the least, unnecessarily add weight and stiffness to the shoe). Unless your foot doctor suggests you use orthotics in a support shoe, why do it? Color does not matter...but it might to you. Face it, the purpose of running shoes is to protect your feet with comfort while maximizing your running potential and correcting for any foot issues and improper foot strike. Note that color is nowhere mentioned in the last sentence. But if you can't stand the color of the right shoe for you, by all means, try comparable shoes from other manufacturers or see if you can order a different color for the shoe that in every other way is right for you. How the shoe looks doesn't matter...but it might to you. Some shoes are high profile, some are low. HOKAs, especially, look "clunky" or even "orthopedic" to some people, but their very light weight, extreme cushioning, lower drop (lower angle from heel to toe) and rocker bottom (upward sole curvature at the toe) are just the ticket for many runners. Again, put looks last in how you evaluate running shoes. Don't expect this year's model to match last year's. Sadly, your long-time favorite shoe might not be the same in the next model. Too many runners might not have liked it, a flaw might have been addressed or the manufacturer may have wanted to update the shoe for competitive reasons with what it believed was more advanced technology. For a while I was a volunteer shoe tester for a leading manufacturer: I and my peers tested changes in popular models. I quit the program when a shoe I tested with a proposed change led to injury. Better me than you, right? But even changes that make it through the testing process might not work for you. Comparison test. When shoe shopping, start by putting on a pair of shoes that are your favorites or that likely will be right for you. Walk and run in the shoes and note how it feels. Then remove one shoe and replace it with an alternative choice that might be good for you. Walk and run with the one shoe from the original pair and the other from the different pair and note which one feels best. Remove the one that's the loser in the comparison test and put on another shoe. Continue this process through multiple shoes and you will gain greater understanding of what shoe feels best. Be sure it feels right. That's the bottom line. When you have honed on the type of shoe that you should be wearing and have tested your options, choose the shoe that feels the best. For most people, appropriate shoe options abound. Among these options different manufacturers use different lasts, different materials and different technology to address the runner's need. This is the point at which you should pick the shoe that feels the best for you. Usually, the swim is my weakest event in a triathlon. Not that I haven't worked to get faster. I have been swim training since 1991, was coached in the pool over a decade, have been swimming masters workouts since 2000 and even wrote the workouts for our group for several years. The importance of form in swimming has been brought home to me again over the last month as I have resumed twice-a-week masters swim workouts. I had an 18-month hiatus from swimming masters workouts because of health reasons and then a move halfway across the country. Lap times I could easily hit in 2015 are a challenge in 2017. Yes, some of my slowness is due to lack of swim conditioning, but I came to the pool in good shape and after a month I am in better shape. Anyway, this morning as I was only able to make my intervals on 200, 100 and 50 sets when I swam hard, I began to pick apart the problem. Yes, I still am hardly in top swim condition. But the other half of the answer had to be in my form. Keep your forehead just below the surface of the water. Swim "downhill," don't drag your feet; press down on your chest to get your hips and legs up. Keep your elbows high on the stroke: think of the motion as similar to pulling your hand out of your front pants pocket. Rotate your torso to the stroke side, but not over 45 degrees: Rotate your hips and shoulders, not your head and feet, around your spine. Reach forward with just a slightly bent arm, but don't cross over your body's midline. End your forward reach under water, not in the air. Stay at full arm extension for a moment at the end of your reach and glide; try to limit your stroke count. Cup your hand on entry, fingers together, palm down, thumb entering first. Fully extend your arm behind you, thumb grazing thigh. Rotate your head 90 degrees (just one eye out of the water), looking just slightly ahead; don't lift your head out of the water to breath! Kick from your hips, not your knees, point your toes and slap the surface of the water with the tops of your feet: Relax when you kick! Focus on swimming from your core rather than thinking of swimming being all "arms and legs." As I focused on various aspects of my form, keeping my elbows up, reaching and rotating helped my times, but they still were pretty sad. Then came the "aha!" moment: I had relapsed into my long-time bad habit of kicking from my knees, even in spite my board and fins kicking warm-up drill where I concentrated on not doing just that! On my final 100 and 50s I made sure to kick from my hips and think about swimming downhill to get my feet up rather than dragging them. The result: On my last hard 50 I cut 7 seconds off of my previous "fast" time. Indeed, swim form is really important! This post is about swim form, but I don't want to leave the impression that form on the bike and in running does not matter. Here are just a few of many ways form makes a difference in biking and swimming. Biking is an aerodynamic sport, so presenting minimum front to the wind without impeding power matters. Also, a poor pedal stroke sacrifices power: The pull up is often ignored by newbie riders. Likewise riding a straight line (rather than wandering or wobbling) is important for speed. In distance running, over-striding is a common error that slows the runner and can lead to injury. Knee lift adds speed. Landing midfoot rather than on the heel absorbs shock and enables a good push-off. A slight forward lean engages gravity to the runner's benefit. In the future I will elaborate on good biking and running form. For now, the message is, form counts, in and out of the water. As we train, we need to work on improving our form for better racing results. We are speeding toward the next phase of the grand annual cycle that governs the lives of runners and triathletes: spring racing. While our current focus needs to be on getting in the training that we need to be successful, it's not too early to ask, "How will I race this spring?" That is, beyond your training, what can you do to assure before and during the race that you race well? Have a race plan - but adapt it to the weather and other conditions. Dress for the weather but don't overdress. Show up early, not late, so you can be centered when the gun goes off. Use the porta-potty before the race. Don't be stupid by going off the line too fast and burning yourself out. Hydrate, pay attention to your electrolytes and take in appropriate nutrition. Those are basics for successful racing. Heed them and you likely will race well. But let's move to the next level of thinking. How can you have your best race, fastest time, highest rank in the age group? I have 15 "best race secrets" for you, gleaned from my half century of racing experience and that of many others. These tips are not really "secrets," but they are not all that obvious to many athletes, even those with considerable experience, as evidenced by the actions I see athletes take or not take at races. Combining the following "secrets" with the already obvious steps listed above offer you the possibility of having a stellar, "Wow, I never knew I could do that!" race, maybe even the race of your dreams (assuming your training has prepared you for that kind of race, of course). Envision success. The power of the mind is something we need to tap going into in our races. The way to engage your mind in the most positive way is to envision the race and your success in it. Some professionals go so far as to envision their progress on every leg of the course, from start to finish, and to see and feel a great finish, with spectators cheering them across the finish line to a great result. Envisioning success changes expectations, our adaptation level, the level of outcomes which we expect and will judge as gains. Envisioning success helps commit us to achieving that success. According to the commitment heuristic, we tend to believe that a behavior is correct and are driven to achieve it to the degree that it is consistent with our prior commitment, our envisioned race. Envisioning success taps into our desire to avoid cognitive dissonance, which is the discomfort from trying to hold on to two competing ideas in our head. If we envision ourselves as a successful competitor, then in the race we are driven to behave in a way that matches our prior vision. Envisioning success reframes how we think about ourselves - we are a successful athlete! - and emboldens us to act and challenge our previously assumed limits despite our very human aversion to losses. Envisioning success kicks in our unconscious mind, which will continue to process on how to achieve a successful race long after we envision it. Envisioning success shows us the rewards we will gain when we are successful - be they satisfaction, fun, applause, recognition, greater fitness, a medal, an awards ceremony - whatever you might view as meaningful. Envisioned rewards are motivators and reinforcers that can drive us to a better performance. Warm up. Time and again I see most of the entrants at races standing around talking before the race, then wandering to the starting area. I'll concede that warming up at some races is hard to do. (Up until a decade ago I could jump out of the start pen and get a warm-up run in at both the Boston and Chicago Marathons, but security today makes that not possible.) Yet, most of the time, nothing is stopping you from getting a good warm-up in before you power off of the starting line. Especially in shorter races, my best times have come when I warmed-up appropriately. My coach Jim Spivey drilled into us that to have a good 5K or 10K race, in the half hour beforehand we should run easy for 15 minutes or so and then run six 100-meter strides (pickups run a little faster than race pace, with a 5 second or so pause in between). Often it's possible - and fun! - to run these strides off the front of the start line, with the "big guns" who are doing the same thing. For a triathlete, a warm-up swim (sometimes discouraged by race officials: Then it must be done surreptitiously or away from the start area) serves the same purpose. Push up. Running around other runners takes valuable energy and wastes time. For triathletes, swimming around other swimmers likewise needlessly expends energy and time. Get close to the starting line or the front of the starting pen or to the front of the wave. Understandably, you don't want to impede other runners or swimmers, but starting with people who are taking the race seriously and who may be just a bit faster than you are will help you get a better time. My best 5K times were scored in races where I seeded myself nearer the front - even in row 2 in a Washington, D.C., race - a tactic promoted by my friend John Duffy, who was an excellent runner for Marquette University. Likewise, I learned in my many years of running the Chicago Marathon that being at the front of the pen makes a real difference, because you get a lead out on the runners with you in the pen who qualified around your pace and those in the pen ahead of you run away from you because they are faster, leaving you room to run. My best age-group leading swim time in a sprint triathlon came in a race that had a time trial start and I had no one in front to impede me. Run, swim or ride the tangents. So long as you don't cut corners or go off course, you can take all the turns on the inside and run the straightest line possible aiming between corners and along curves. Running the outside of a curve rather than the inside can add as much as 40 feet of distance. And then not running a straight line to the next curve will add more distance. On a marathon course with many corners and curves this can add up to as much as half a mile! The same guidance applies to swimming - swim the buoy line as much as possible without being slowed by the melee of swimmers. As for biking, corners are key: Look where you want to go, brake before the corner if necessary, not in the turn, go into the corner wide, cut to the apex - the straightest line through the corner - and finish wide. I gave my friend Margaret the "run the tangents" advice and then she ran a Boston qualifying marathon that got her into the race with less than 30 seconds to spare: She attributed her qualification to focusing on running the tangents. In 1983 Rod Dixon scored a spectacular victory in the New York City Marathon by running the tangents to catch the leader, Geoff Smith, who was running the road, not the tangents, and nip him at the finish line. It makes a difference! Make hills your friend. Many racers view hills as a difficult impediment to successful racing. While they do add difficulty, hills present every competitor the same challenge. The secret is to make the hill work for you relative to others. To make hills your friend, change your mental approach. Because at even energy expenditure you slow down going uphill, the net effect of the uphill on race time is disproportionate to the distance. And then because of the work expended to get up the hill, the tendency is to use the downhill for recovery. Consider changing that approach: Add a little more power than "even effort" when you go uphill - but not so much that you burn yourself out. Use gravity going downhill to regain speed and time. For running uphill, this means keeping your head and chest up, leaning a bit forward but keeping your center of gravity over your feet, pushing your feet off and up the hill with shortened strides, punctuating your arm swing, adding more power as you get further up the hill and maintaining pace over the top. Going downhill, lean forward from the hips and keep your feet under you (don't overstride), shorten your arm swing and use your arms for balance, and look in front of you rather than down at your feet. For biking uphill, studies show you will benefit timewise by increasing your power output a little on the uphill, the increase metered by the steepness, less for shallower hills and more for steeper hills. But be careful not to increase your power beyond the the range you’re able to hold for the duration of the uphill. And, as with running, don't back off just when you hit the top - power over the top and take your speed downhill. Drink and eat on the move. How long does it take you to go through a water stop? In longer races, do you stop to eat a gel or something else? Maybe it's my triathlete mentality, but I want to spend as little time as possible away from "relentless forward motion." Learn to drink and eat on the move! I suggest working on grabbing a cup of Gatorade or water on the run, squeezing the cup a little on the sides and downing it while not breaking stride. If you get too little water in your mouth that way and instead jostle it out of the cup, you can increase the odds you will get enough to drink by grabbing two cups at a stop, one with each hand or sequentially at the front and the back of the stop. As for eating gel, here are two approaches. One is to pull the packet out when the water stop comes into view and have the gel in your mouth when you drink. The other is a technique I have often used in marathons, which is to "sip" the gel, meaning to squeeze little bits into your mouth as you run along, not worrying about coordinating eating and drinking. Get a ride. Wind resistance is a factor in running and biking. When legal to do so, triathletes should seek to draft off of other riders in races, preferably at the back of a fast pack, where the energy savings can be as much as a third. As for runners, drafting is always legal - and yet so often we ignore this technique, which can make a meaningful difference, especially when running into a head wind. One study* showed that a fast runner who runs two or three feet behind another runner in still air will expend as much as 7% less energy than the runner in the lead. The benefit grows with a strong headwind, and even slower runners will save energy by drafting in this situation and thus can run a faster race. Note that you don't need to be running directly into the wind to benefit. If you watch the Tour de France, you will often see riders form an echelon, in which the riders are arrayed like one side of a V, staggered across the road from front to back parallel to the wind. The key for runners is to get another runner or a pack to block the wind. Being a smaller runner, typically I have no problem finding a larger competitor or better yet a pack running my pace or a little faster to run behind. For drafting in running there are really no "social norms," unlike in bike racing where the etiquette is to trade off leading when pack riding. Nonetheless, when I draft off of another runner I try not to get so close that I am in his or her "space" and become an annoyance. Pick 'em off. A fun way to race faster is to find targets and "go get 'em"! Spy a runner ahead of you and speed up just a little bit to see if you can close on them. If you can, keep focusing on the target and close in and make the pass. Afterward, you can drop back to your previous pace, having put one more runner behind you. Do this a series of times and you can significantly improve your race position and also up your average pace. But be aware that if you view each target acquisition and pass as running a hard interval, you can burn yourself out before the end of the race. The key is to overtake those running your pace or just a bit faster than your pace and to do it gradually. King or queen of the age group! A related mentality to the "pick 'em off" technique is to look for competitors who may be in your age group: These are the racers you want to put behind you! Passing them is very motivating. Just be sure not to provoke the fellow age grouper when making the pass: Saying "gotcha!" may wake them up to fact that they will be one down in the age group and result in you being repassed. Net tally. Another approach akin to "pick 'em off," especially appealing to analytical folks like me, is to keep a net tally in your head of how many people you pass versus how many pass you. I find that wanting to keep the count a strong positive motivates me to race more assertively and not get lulled into a slower pace. This usually works better in smaller and shorter races, obviously, because counting skills are taxed when racing. However, I have also been able to apply it in half Ironman and Ironman bike segments, perhaps because as a slower swimmer I typically have been able to pass many, many riders and build up a strong positive count. Surge. If you watch elites race, whether on the run or on the bike, you will see them pick up the pace to see how their competitors respond. If the fellow runner, rider or pack does not respond or falters, that's the signal to keep going and open a hard-to-close gap. If you intentionally throw in one or more surges that are just within your capability given the rest of the race to be run, you can overstress and drop other runners or riders who are not prepared to pick up the pace. Best times to surge are when others appear to be struggling or fading, on uphills and toward the end of the race when competitors are tiring. But beware, surging when you, too, are on the edge can eat into your energy reserves, cause lactate to build in your muscles and ultimately slow you down so you lose the ground you have gained and more. Spring a surprise. Stealing a march on a competitor who is not aware of your presence can be the key to racing success. Hanging off a runner's shoulder, just outside of his or her field of vision, and then jumping ahead at the right time can put the runner on his or her heels. In a hot, tough half Ironman race in Wisconsin, I had pushed through the swim and the bike, and, despite cramping on the run, believed I had bested most of my age group competitors. The finish line was in sight...and then an age group member who had been stalking me blew by. I tried to respond, but could not find another gear to catch up. There went a podium spot! Likewise, in a 5K at the start of mile three I passed my buddy Jerry to be the leading runner in our age group. He did not seem to respond to my surge, so I kept going and did not look back. But he got me in the last 100 meters: He had been hanging back in my blind spot for I-don't-know-how-long, just waiting to jump by me when I was lulled into thinking I had the victory. There was too little time left for me to respond and see if I could find another gear to catch him. Psych 'em out. So much of racing success is mental. You are what you believe - and the same is true for your competitors. If you can get others to believe you are the better racer, that can go a long way to boost your odds of success. When I was racking my bike before a triathlon with swim and bike sprint distances but a 10K run, which favored my strength as a runner, I introduced myself to a fellow age grouper. Tall and muscled, he talked about just winning the Illinois time trial cycling championship for our age group. I was suitably impressed and thought, "Well, there goes any chance of winning the age group." Simply, he had psyched me out. So when I caught him on the middle of the run, I was a little surprised. But I had not forgotten that he was the best time trialer in the state: In my head, he was filed in the "better than me" category. When he suddenly sprang a surprise and surged ahead of me, my response was feeble and, indeed, he won the age group. Luckily, that was not the end of the story. A year later we met again before the same race. This time I purposefully talked about my age group success the prior summer at Ironman Canada and my age group leading swim in the same lake earlier in the year. Reverse psych out! This time when I caught him on the race, I paused for a moment, said hello, and then took off. Despite obviously trying, he could not catch me in the final mile. He might have been the better biker, but with a stronger swim and an even stronger run, I was the faster triathlete, and I think he knew it even before my surge. Be in the moment. Disassociating - thinking about something else - is a way to deal with pain and difficulty. However, it's proven that in most cases associating - being in the moment - results in better race times. Focus on your pace, form, breathing. Pay attention to the topography and the line you are taking and the best way to run, ride or swim the course ahead. Be aware of the opportunities and obstacles that those around you present. Continue to review your progress and status - splits, heart rate, aches and potential cramping, etc. - and adjust your race plan, as needed. By "being in the moment" you may be able to achieve a "flow state," which psychologist Mihály Csíkszentmihályi described as being the mental state in which a person performing an activity is fully immersed in a feeling of energized focus, full involvement, and enjoyment. When an athlete is "in the zone," the result is full absorption in the race. I vividly remember times when I achieved a flow state and had a great race as a result. For instance, I will not forget the sprint triathlon in Indianapolis when the rhythm of the race seemed perfect, from an intense swim and first transition to a hard bike leg which I nailed to a run that began with me matching the eventual female winner stride for stride for the first several miles, resulting in a four-mile PR and an age group victory. I remember the stark engagement of "me against the elements" in epic rides into high wind at Aurora High Cliff Half Ironman in Wisconsin and in a massive thunder storm at the Rockman Half Ironman in Illinois (both age group wins). I remember my 5K PR on the fastest course in Illinois, a straight flat-road out-and-back, being fixated on the turn-around point going out and finish banner coming back, little else entering my field of focus beyond my effort, striding and breathing. Flow is as good as it gets in racing! Be confident. Confidence is a key racing variable. In the end, how you race is in your hands, no one else's. Before a race it is so easy to look at super-fit athletes - or at least those who appear to be better equipped and prepared to race than you are - and feel inferior. A lack of confidence, feeling imperfect and inadequate to the challenge and the competition, can lead to a sub-par performance. When I showed up at registration for my first longer triathlon, a regional race with a draw, I was blown away by the hard bodies and expensive equipment. Did I belong? Surely I was not of this high caliber! When your attitude is that you will do the best that your body and conditions allow, and enjoy and even relish the experience, you are more likely to make the most of the opportunity and have the best race possible. I learned as I repeated big races multiple times, case in point Ironman Canada 10 years in a row, that what really mattered was not the terrain or the equipment or the other racers and their training, conditioning or mindset. By far the biggest variable beyond my own training and health was my attitude, how I approached and executed the race. When I embraced the reality that my real competition was myself and no one else, that self-limitation was the biggest barrier to greater success, my confidence soared, my enjoyment likewise mushroomed and my vastly improved race results reflected the difference. Diane was my speed skating coach at Olympic Training Center in Marquette, Michigan. No, I was not a potential Olympian: My then teenage daughter was in the short-track speed skating Olympic training program and I was a chaperone. Because I was a masters short-track speed skater, I had the privilege of receiving the same coaching and doing the same workouts through the week as the team of young athletes who included future gold, silver and bronze medal winners. My daughter was not quite fast enough to ultimately make our Olympic team, but her friends Chris Witty and Becky Sundstrom went on to skate in multiple Olympic games: Chris won silver and bronze medals at the Nagano games in 1988 and gold at the Salt Lake City games in 1992. Dianne in her own right had won 1 gold, 2 silver and 1 bronze medal for the U.S. at the 1968 Grenoble and 1972 Sapporo games, and then she went on to coach Eric Heiden and his sister. You may know that in the 1980 Olympics at Lake Placid Eric won 5 gold medals, then the highest individual gold-medal count earned by any Olympic athlete in a single Olympics. At the speed skating camp, Dianne was head coach, surrounded by assistant coaches, exercise physiologists, athletic trainers and sports psychologists. I started the week not recognizing just how stellar an opportunity the camp and world-class coaching offered me as a masters athlete and future coach. As the week progressed, it dawned on me just how transformational and special the experience was for a then "weekend warrior." At the top, being a successful athlete is a lifestyle. Successful athletes continually work on improving their game across the spectrum, including form, fitness, mindset, nutrition and fueling, rest and sleep, recovery, heart-rate training, cross training, strength training, speed work, endurance, equipment and clothing, training progression and much more. What the public sees at the Olympics are athletes at the very top of their game, and the usual conclusion is that these athletes have trained and raced a lot. Indeed, they have, but what often is not understood or recognized is the detailed thinking, learning, execution and commitment over a very long time that has accompanied and made possible the successful training and racing. Success breeds success. When athletes train with the best, they are pulled and pushed to raise their game. "The best" offer role models and sources of great learning about how to be better and get better results. Several years after my involvement at the Olympic Training camp, I retired from short-track speed skating when my daughter left the sport, refocused on running and became a triathlete. I soon found the opportunity to be coached by runner Jim Spivey. Jim competed in the 1984, 1992 and 1996 Olympic games in the 1500 meter and 5000 meter track events, facing legendary runners such as Sebastian Coe, Steve Cram, Steve Ovett and Steve Scott. Jim did not medal, but had run the fastest high-school quarter mile in the country, was NCAA 1500 meter champion and twice won the 1500 meter U.S. Olympic trials. He ran his fastest mile, 3:49.80, in 1986 in Oslo, Norway. For 28 years his 1500-meter time of 3:36.06 was the fastest run by an American in the Olympic final. His U.S. 2000 meter time of 4:52.44, set in 1987 in Lausanne, Switzerland, still stands today, 30 years later! Running should be fun. When it isn't, reset your attitude and/or your training. If running is not your job, don't treat it like work. Running is a privilege. We are blessed to be healthy and able to run and compete. Appreciate that blessing and share it! Slow down. The best training is at specific, controlled paces. Too often runners get into a competitive mode in training and overrun the workout. Too often coaches overwork their athletes rather than peak them for key races. Burnout and injury can be serious consequences of overrunning and over training. Respect the purpose of the workout. A structured training program is designed to get the runner the best results. Tempo runs, track workouts, long runs and other types workouts have distinct and different purposes. To improve beyond a base level, a runner (or any endurance athlete, for that matter), needs to stick to the intent of the structured training program and not just "run to run." Strategy counts in racing. Know the course, the competition and where you are in your training. Have a race plan. Unless you clearly are the fastest, don't try to hold the lead. Jim was good at hanging off of top competitors in more tactical races and then surging ahead toward the end of the race. An intense competitor when racing, he was known to say in passing, "Thanks for the ride!" Photo of Dianne Holum at 1500 gold medal presentation at the 1972 Winter Oympics in Saporo, Japan, copyright National Speed Skating Museum and Hall of Fame. On the spectrum of runners, where are you? If you are not just a jogger, it's likely that you want to take your running to the next level in 2017. Goals. We achieve more when we are going after tangible goals. Set concrete goals - races, times, miles, number of days running, whatever stokes your fire. (Try out our tool to help you set your goals: 2017 Running Survey.) Announce your goals - we are more committed to achieve a goal when others know we are pursuing it. Follow a training schedule embodying your goals, such as scheduled long runs leading up to half or full marathon distance races or track workouts to make you faster. Purpose. Have each workout serve a purpose. Don't run "junk miles." Work on specifics when you run, such as turnover, pace, form, hill running. Consistency. We improve when we do something many times over and make it a habit. Running is a good habit. Making running like breathing - you can't do without it. Keep a log showing your planned workouts and workout results, planned races and race results, and PRs. Change. Change forces us to adapt and grow. Change your pace during runs and for different runs. Run intervals on the road and track. Do tempo runs and tempo segments in longer runs. Run new routes, new distances and new races. Strength train in your off season. Recovery. Take days off, planned and when you need them. Schedule recovery runs. Warm up and cool down. Stretch. Practice "active recovery" - slow running in between hard running. Think "hard-easy," "on-off." Cross train. Listen to your body. Rest and sleep. Help. We do better when we get help from and are supported by others. Run with others. Seek knowledge and advice. Get a coach. May 2017 be your best running year ever! I am not a "resolutionist"! You know what a "resolutionist" looks like: It's the person who shows up for a few weeks in January for the group run or at spin class or in the pool, resolved to finally make working out a habit, to be pursued throughout the year. Around the first of February, you look around and they are gone, never to be seen again - until perhaps the following January. People who make New Year's resolutions often don't follow through on them because the resolutions are wishes, not goals based on a vision of the future, with a well-constructed plan to achieve them. I don't make New Year's resolutions, but I do set vision-based goals and develop strategies with specific actions to achieve them. This is the time of year I plan my running, swimming and biking for the year ahead. Out of this planning comes a set of races I am targeting and a detailed daily training schedule (sometimes laid out for a half year at a time) to put me in the best position to succeed in my target races, as well as to yield the fitness, well-being and overall enjoyment I get from running and multi-sport. This time around, I have decided to share some of my methods with my runner and triathlete friends. I asked myself, what's the best way to start in building a solid plan for 2017? What do I typically do? Based on what I know as long-time masters athlete and coach, what are the keys to success that we should consider when setting our 2017 goals and putting together our plan to achieve them? Number of days you plan to run. Your target training and racing paces by distance. The elements of heart rate training. Planning and tracking training and results. The elements to include in your training schedule. Ways to increase your running speed. How to avoid injury and promote faster running. Planning and executing your target A and B races. Your big racing and training goals for 2017. When you finish the survey, you will receive an email with your responses to the questions. Your answers will show your running training and racing goals for 2017. These answers, as well as the specific dates for your planned races to the extent you know them, are the elements you or a coach will need to construct and adjust your detailed 2017 training schedule. Try it out! After you complete the 2017 Running Survey and get the summary email showing your goals, let me know how helpful you find this tool. Your feedback will help me continue to improve it so it becomes even more helpful in planning for running success. While I would like to think that completing the 2017 Running Survey is all that's needed to get on with a great running year, setting your goals is the beginning of the process, not the end. As a strategy consultant and researcher, I know in spades that goal setting is the easy part of planning and success. Acting on the goals with a feasible plan is essential. When you know what you want to achieve in 2017 and have clues on ways to reach your goals, the next step is to construct your day-by-day, week-by-week, month-by-month training and racing plan, periodized and targeted to your A and B races. You may know how to build a winning schedule, as I do. I have learned to build training and racing plans from my coaches, deep immersion in the literature and research on training and racing, and years of experience writing schedules for me and for other athletes. Good for you if you have gained similar knowledge and have the needed skills! Yet, over the 25 years in my career as a masters athlete when I was intent on great improvement in my race results and fitness, when I was targeting Boston Marathon qualifying times, a Kona Ironman ticket and a 20-minute 5K time in my 50s, I knew enough NOT to write my own training schedule. Why not? Because beyond the skills to write a winning schedule, a coach has objectivity that we never can have about ourselves. A coach is a sounding board who brings realism and experience to help us get to our goals in a way that promotes health and enjoyment. A coach makes us more accountable for our training. A coach not only can work with us to build our schedule but can hep us adjust it as the year proceeds based on our results and situation. Need a winning 2017 running plan and assurance you will pursue it? Don't be a resolutionist! Complete the 2017 Running Survey and then share the results with me or another qualified coach who will work with you to put the detailed plan in place and help you execute it for greater running success and enjoyment. Smart workouts for "serious fun": The training plans in Rob Sleamaker and Ray Browning's excellent book, "Serious Training for Endurance Athletes," which I found to be invaluable when I wrote my first Ironman schedules, and a Jim Spivey Running Club track workout that I adapted for the Annapolis Striders track group a few months ago. Yesterday I ran a nice contemplative solo warm-up mile, then some fartlek laps around and across the track and on the hillside outside of the track, and then another enjoyable ending mile or so with a fellow runner/triathlete. This run, about 5K in length, was entirely unplanned. The only plan was to support the new runners and returning runners involved in the running club's 5K training group that met at the track. The group of maybe 20 runners loosened up and then ran and walked laps - 3 minutes run /1 minute walk. After that the group did a series of stretches. My contribution upon my arrival at the end of my warm-up run, when the group was assembling, was to suggest that all of us were over dressed, with the temperature an unseasonable 55 degrees later in December. I shed my vest and tights to run in just a shirt and shorts. Heaven! (Had I still been in Chicago, my run would have been in snowy subzero conditions - or more likely on the dizzying 11.5-laps-to-the-mile indoor track.) I was introduced as the club's track coach and had an opportunity to pitch involvement in our track workouts that will resume in March. During the group run/walk laps, I targeted some people whom I had not yet met for conversation, running/walking a little with each person, then cutting across the track to connect with another person. I get inspired by these conversations with aspirational new and returning runners. For them, running is a shiny new object; for me, the joy is helping them learn to run and about running and, most important, to see that running can be fun. One of my new Annapolis running friends, herself a relatively new runner, has accused me of being "too serious" about my running. She has observed me doing intervals and tempo segments during group runs, paying attention to mile splits, being sure I get in my long run miles and being psyched about good race results. The people we run with are mostly like her - running for fun, fitness and companionship. I am the odd duck in this bunch because of my competitive focus. Yet in recent weeks, during my usual end-of-year off-season (when I am not pursuing a training schedule aimed at my next big race), she has observed and commented favorably on another side of my running as I ran several "unplanned," even last-minute, races. I had a blast during the informal Thanksgiving fun run. With one day's notice I paced the 2:15 finish group in the Annapolis Running Festival half marathon with friend Henry, cracking jokes all the way. And at the last minute I went into the club's 15k race with my stated attitude being "I have no goal for this race." With my "no goal" attitude, I started the 15k race slowly, but then, still with no plan in mind, decided to put the hammer down on the first big hill, flying by Henry who like me had said he had no goal for the race except to finish and get his "ironman" award for running all the races in the club series. I maintained the greater effort and sped (for me!) along the hilly trail through the woods, paying little attention to my mile splits. After a few miles, Henry passed me, with a "I thought you weren't going to race this!" exclamation as he went by. I said the hill woke me up and told him to go for it. Over the course of the rest of the race I kept pushing, but watched Henry, 20 plus years my junior, get farther and farther ahead of me, finally disappearing from sight in the final miles. Never having seen Henry run this fast, I realized I had awakened a sleeping beast of a runner! In the last few miles I knew that even with no plan I was running a good race, and started looking at my watch. My splits showed me slowing: Had I really meant to race the 15K, I would not have dogged the first mile and then blasted the hills so hard early on. I would have saved a little more energy for the final miles. But I hung on and finished 7th of 26 in the 60-69 age group. At 68 I was at the wrong end of the age group to get a medal: Had medals been awarded for the more usual five-year 65-69 age group, I would have been first among 14 runners in the older age group. Call me "competitive" and I fully agree. A large part of the allure of running and triathlon for me is seeing what I can do and enjoying the "flow" of running and biking and swimming fast. I like a little competition, as Henry offered. But to call me "serious" about running (or triathlon)? That sounds too much like how one approaches a job. Running and triathlon are not my job (except when I am paid to coach athletes - and that's about their running, swimming and biking, not mine.) Running and triathlon for me are, as I tell those whom I coach and help, fun. With a bow to my running friend, I am happy to call my running, swimming and biking "serious fun!" Put down the beer and bag of potato chips. We need to talk. You have diligently trained, smartly peaked, made it to the starting line and raced the race you have been envisioning for months. PR or disappointing result, your goal race is behind you. Having raced maybe 320 times in marathons and shorter running road races, cross country races, duathlons, Ironman and shorter triathlons, and short track speedskating races including national championships, I know the "now what?" syndrome all too well. Establish a baseline workout plan for when you are not training for a race. Otherwise, you will balloon up like a whale and have to buy new clothes - which will only look good until you finally get back to training for your next goal race and get back to your svelte, well-trained self. Work out with friends, who will keep you honest and responsible. Be spontaneous. Run a 5K or trail race or do a duathlon or sprint tri that were not on your schedule. It's time to try new things! Cross train. You can maintain fitness in the pool or on the bike or trainer. Gym workouts and yoga can help you gain strength and flexibility until you start up training for the next big race. Find a new goal race. For me, that's the key. Always have the next great race on the calendar to target. Having run the Baltimore Marathon (poorly because of injury) two weeks ago, I have the Chesapeake Bay Bridge 10K Race ("It's just a bridge. Get over it.") in a week. I then have more shorter running races on tap, and, for my next "A" race, plan on running the Baltimore & Annapolis Trail Marathon in the spring. Re-commit to training. Having races through March in my sights helps me commit to a solid training schedule through the rest of the fall and the colder winter months. Work on improvement - building speed and strength, improving technique, what ever will give you a better result in your next goal race. Most important, I think, understand that running and triathlon in their most healthy expression are a lifestyle not something episodic. For me, running and working out are like breathing, an essential part of living.